With the announcement of Apple’s ARKit and Google’s ARCore, augmented reality has been the talk of the tech world this autumn. But is there more to this technology than dancing hotdogs and evasive pokémon? The short answer is ‘yes’. Amongst suggestions that range from the useful (such as a daily medicine dose tracker) to the ridiculous (spider fear-factor scale, anyone? ), there are augmented elements like Amazon’s new AR view feature that really could improve conversion and satisfaction rates, for retail apps in particular. It’s hardly news that online shopping has superseded traditional, bricks-and-mortar retail in many sectors. The advantages of buying online are clear. Customers get immediately accessible, permanently open, geographically unlimited stores; companies have a cost effective process that minimises expenditure on rent and staff, and makes introducing new products almost instantaneous. That said, there are still aspects to buying online that leave some consumers cautious and limit growth. One of the main benefits of internet shopping is the convenience, banishing afternoons spent traipsing up and down a damp high street to being a thing of the pre-mobile past. However, that’s exactly where some of us still do end up if poor quality visuals compel us to see a product in person ‘just to be sure’, or, worse still, engage in a volley of returns and repurchases in order to get it just right. A report on consumer preferences found that 49% of those surveyed were discouraged from buying online by not being able to touch, feel or try a product. Whilst technology can’t (yet) enable you to feel products virtually, AR in apps offers a solution to this in terms of both convenience and certainty. 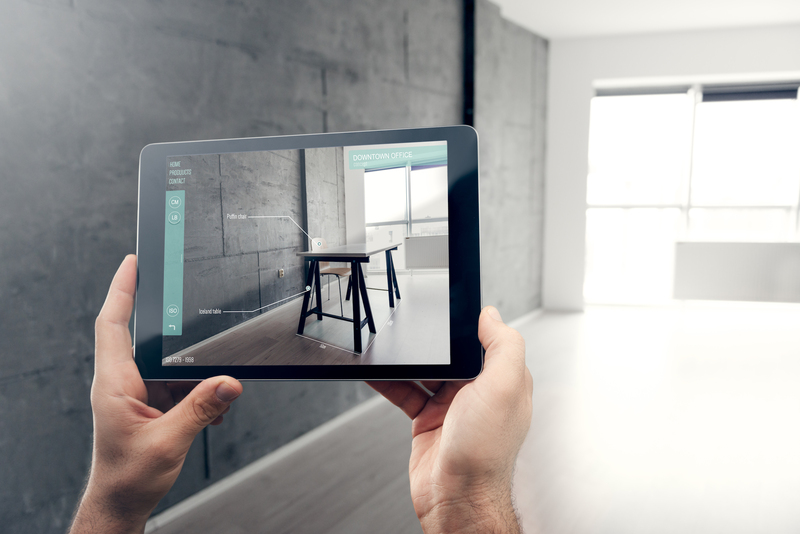 Amazon’s AR app feature allows you to try before you buy, choosing from a selection of furniture and electrical products to visualise in your home. Ikea also offers similar app functionality. Not only do customers get to have those squabbles about the colour of the sofa in the comfort of their own homes, they can change their mind a dozen times before lunch, all by tapping into an app. The advantages aren’t limited to homewares either: a collaboration between Evrythng and Zappar uses AR to make Internet of Things objects more interactive. The in-app AR experiences of users provide insights into where and when products are being bought and used, leading to increased active engagement and rates of repurchase. Crucially, for the vast majority of us who don’t have a specific AR headset or glasses, this technology is currently only available in apps. Whilst these might still be a work in progress when it comes to AR, it is nevertheless the case that the mobile app allows consumers to go places that conventional desktop (or even mobile) internet cannot take them. The combination of camera, location, and app intelligence means that by the time the ‘Complete Transaction’ button is clicked, customers can be sure that they’re going to love what they’re getting. This keeps returns to a minimum - a benefit for both customers and retailers. Conclusion? The transition from traditional retail to e-commerce is rapidly moving in a specifically mobile app direction, and even for those companies who won’t be involved with AR (and there won’t be many of them), it’s a trend worth taking note of. All this is before the buzz surrounding AR is even taken into account. It is, undoubtedly, exciting tech. Not long ago, this kind of functionality would have seemed wildly futuristic, and yet here it is helping me buy a new kettle. AR isn’t a gimmick - its potential to influence purchasing decisions means that it’s more than a game - but it is novel enough to drive user interest and downloads. Never underestimate the power of the new: in a highly competitive app market, that kind of edge is definitely real enough to warrant taking seriously.